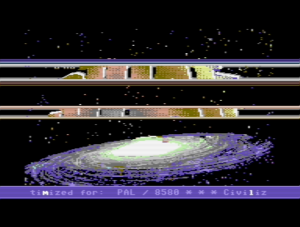 Today I am releasing a new C64 Demo: Galactic Rasterbar Power. Make a demo that works equally well on PAL and NTSC hardware. As a bonus: make the raster bar effect look absolutely perfect in VICE debug borders. This entry was posted in Coding and tagged demo, intros, music on April 4, 2017 by Obliterator918. 30 years (ish) ago, I got my first computer: a Commodore 64. I learned to program with it. But I stuck with BASIC while I had the C64. I always wanted to learn assembler and write super-fast and fancy games, but I just never did. I didn’t have a monitor cartridge or even know what books to use. Anyway, I decided that late is better than never. And since OVGE is coming up in less than two months, I decided to make an “OVGE Intro” on my C64. It’s by no means a modern-quality demo, but it has some effects I always wanted to achieve way back in the day. Developing for the C64 today is so much easier than it was in the 80s. Using cross-development tools, all of the work was done on my Windows PC (I just used Notepad++ to write the assembler code and ACME to build it) and testing was done in VICE. Of course, I put it on a real C64 for viewing the best results. Here is a quick capture I did and uploaded to YouTube. Unfortunatly, it is not smooth in this video, though it runs perfectly on the real thing. This entry was posted in Coding and tagged code, intros on August 1, 2013 by Obliterator918.